All of these kits come with 3 sets of cymbals sampled from a Zildjian A series set (stick and brush) and and UFIP set (stick) and 2 additional Ride Cymbals (Turkish and UFIP) and 7 additional snares (Ludwig, Gretsch, Pearl and Tama). These kits have set the standard for classic drum sounds due to the large number of classic hits from the mid sixties and until the beginning of the eighties that were recorded using them. The production concept gives users access to these classic kits, but with a more modern approach to sound production and mic choice. 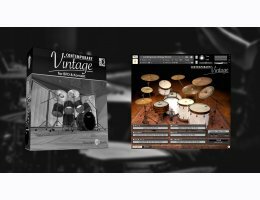 This approach guarantees fresh new sounds can be created with these 'classic' drum kits.